The number of preliminary events was increased from 16 to 25 in the year 2000 at the World Series of Poker. The main event grew a sizeable amount, as well, to 512 entrants. This made it tough to find enough seats for everyone, and play was delayed for two hours at the start of day 1. On the upside of all of the difficulties the large field created, the champion would walk away with $1.5 million, the largest prize ever. Many professional players took home bracelets in the preliminary events of 2000. Most notably, two women players who took home bracelets in preliminary events: Jerri Thomas ($1,500 seven-card stud) and Jennifer Harman ($5,000 no-limit deuce-to-seven lowball). Jim McManus was at the tournament on assignment for Harper’s Magazine to cover the growing success of women on the felt that year, but in addition to the story he was writing, McManus had some other ideas about what to do with his cash advance. He jumped into a satellite tournament and won a seat in the main event. McManus managed to survive deep in the event, but he was close to elimination on the money bubble. A tense hand where he made the right play against T.J.Cloutier gave McManus the confidence he needed to kick-start an aggressive run and grow his stack from 36,100 to 276,000. McManus continued to play well, and at one point he called down a complete bluff from Cloutier for his tournament life with only A-K in his hand, and 5-4-2-7 on the board. Cloutier turned over A-9 when McManus called, and the river brought a jack. The call of the tournament gave McManus the chip lead with 866,000. Annie Duke busted on the bubble of the final table that year, finishing in 10th place and proving that women were making their mark at the WSOP. Just missing the final television table that year were Mickey Appleman (ninth), Tom Franklin (eighth), and Jeff “Happy” Shulman (seventh). The final day saw Chris “Jesus” Ferguson enter the ring with 2,853,000 as the chip leader at the final television table, where he was joined by McManus, Roman Abinsay, Hasan Habib, Steve Kaufman, and Cloutier, who was making his fourth WSOP final-table appearance. Abinsay was the first player eliminated in sixth place when he decided to move all in with A-Q, but he ran into the pocket eights of Ferguson. McManus then found himself holding A Q . Habib moved all in against him with A 4 , and McManus quickly made the call. He was way ahead until a 4 fell on the river and knocked him down to just 100,000. He got that amount all in shortly thereafter with A-2, but he was the one dominated this time when Kaufman flipped over the infamous hand of that year, A-Q, which was enough to send McManus to the rail in fifth place. His storybook run at the world championship was over, but it went on to live forever in the pages of McManus' bestselling book, Positively Fifth Street. Ferguson then went on to eliminate Habib in fourth place, with A-K doing his bidding, and Kaufman in third place when he wielded pocket tens. All of this action had transpired rather quickly, as it only took an hour to get to heads-up play. Ferguson held a huge lead thanks to the three players he had eliminated, but Cloutier was not going to go down lightly. He doubled up with trip tens when Ferguson held two pair early in the match. Cloutier now had some chips to work with, and he put them to good use, climbing back up to 1.4 million. Cloutier almost doubled up again when his A-K dominated Ferguson’s A-7 preflop. But, the board ran out 5-2-2-J-J and they split the pot. Cloutier would not let that stand in his way, though, and he took a slight chip lead with three kings over Ferguson’s two pair. Ferguson lucked out once again with the help of a chopped pot when he held A-2 all in against Cloutier’s A-7. The board fell Q-10-3-K-10 to give both players a pair of tens with A-K-Q kickers. Ferguson reclaimed a slight lead for himself, but it was evident that Cloutier had begun to wear him down. That was when Cloutier made the price of admission 175,000 preflop, and Ferguson reraised to 600,000. Cloutier reraised all in, and Ferguson went into the tank. He thought for five solid minutes, and for one of the few times in his poker career, he removed both his hat and sunglasses. He eventually made the call and turned over A 9 . Cloutier once again had Ferguson dominated, but he held A Q , which was once again about to prove to be the kiss of death in 2000. The board was dealt slowly, with pauses at every street to build anticipation and drama. The flop was dealt K 4 2 . The turn came K , and the 9 fell on the river to make Ferguson the world champion. He got up to embrace Cloutier after the hand was over and then celebrated his victory. 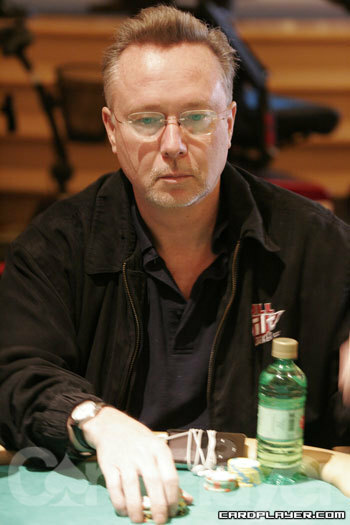 Although Cloutier still has not won the title of world champion, he was inducted into the Poker Hall of Fame in 2006, while Ferguson has gone on to become one the most recognizable poker players in the world.